After I took this one I realized it is a visual metaphor for young people in developing countries. 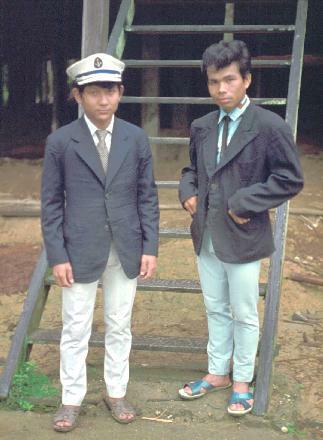 These two Ibans are in western dress; it doesn't fit very well, and they look uncomfortable. Their Western education has the same effect; it wasn't tailored for them, and it sits uneasy. They have a foot in each world, the traditional and the industrialized. They don't fit very well in either one.